Pictures of a victim of brown reclusive spider bite-Unproven! - Truth or Fiction? Pictures of a victim of brown reclusive spider bite-Unproven! Pictures of a Victim of a Bite From the Brown Recluse Spider-Unproven! 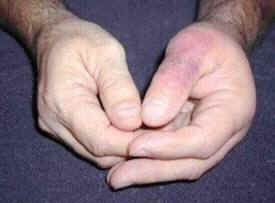 This eRumor includes a series of pictures of what is says is the hand of a man who was bitten by a brown recluse spider. It also claims that the brown recluse is the most dangerous spider in the U.S.
We’ve not found the source of these particular pictures, but they are consistent with what other victims claim to have experienced from having been bitten by a brown recluse spider. CLICK HERE for a site that has hundreds of stories from, and pictures of, alleged brown reclusive bites. 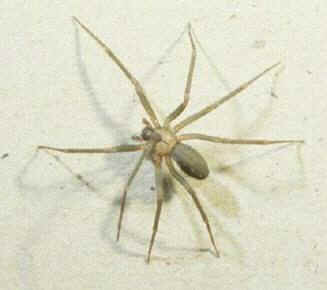 Brown recluse spiders are primarily found in the Southern United States and portions of the Midwest. According to the Department of Entomology at the University of California at Riverside, bites from the brown recluse spider are relatively rare and most people who are bitten do not develop nasty symptoms. 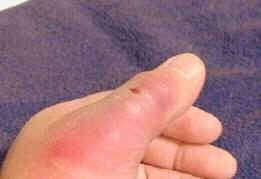 The pictures of reported spider bites commonly show a “slow healing necrotic lesion.” Experts warn, however, that not every case of gruesome pictures may be from a reclusive spider bite. There has been a lot of publicity, especially on the Internet, about the effects of the bite of the brown reclusive spider but doctors caution that an injury should not be classed as a spider bite unless the spider has been seen doing the biting. In Canada, for example, there have been several cases reported of brown reclusive spider bites even though there are no brown reclusive spiders that live that far north. Robert G. Bennett and Richard S.Vetter are professional entomologists. In an article in Canadian Family Physician magazine in August, 2004, they said that 80 percent of spider-bite diagnoses are in error and that when someone gets a necrotic lesion, it is easy to think it might be from a spider. In reality, according the article, many of the wounds are from other kinds of infections and could even be the result of cancer, which would be important to diagnose correctly. This guy was bitten by a Brown Recluse spider. The following illustrates the progression of a brown recluse spider bite. The affected skin actually dies on his body. but take a look at the last one — it is a picture of the spider itself. A person can die from it’s bite. We all should know what the spider looks like. Send this around to people you love. doing yard work, spring cleaning, and sometimes in their attics. Spider bites are dangerous and can have permanent and highly negative consequences. They like the darkness and tend to live in storage sheds or attics or other areas that might not be frequented by people or light. If you have a need to be in your attic, go up there and turn on a light and leave it on for about 30 minutes before you go in to do your work.